The busyness of life often keeps us from drawing close to God. One of my favorite Psalms is Psalm 23. 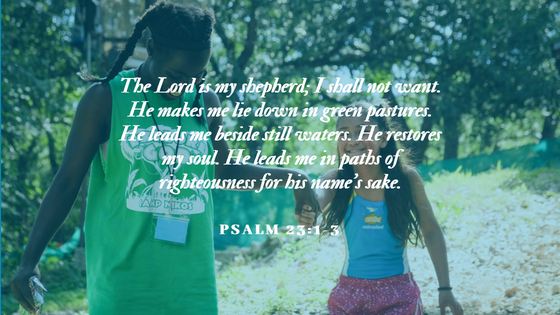 Notice above it says “He makes me lie down in green pastures.” It almost takes a divine intervention for us to pause in the busyness and worship. Some of the greatest memories I have of pausing to worship comes from camp! Most people I meet tell me stories about their experien ces at camp as a child. I had the blessing to attend multiple camps: Scouts, Fellowship of Christian Athletes (FCA) sports camps, church camps, and retreats. There is something powerful and formulative about going to camp. It forces us to retreat from day-to-day life and find rest in Christ. I grew up in a good family, but was quickly chasing drugs, girls, and the world. My family knew I needed to retreat away from my culture and have Christian influences in my life. They sent me to a variety of camps, and the most impactful for me was a FCA football camp. My dad worked for FCA, and he was a dean at the camp. This camp included students from inner-city Chicago as well as kids from small country towns. It was multiethnic and had kids from all kinds of backgrounds. This camp was the most impactful for me because it mixed things I liked, and created an enviornment for relationships to form. I saw the power of the Gospel through sports, camp life, and my camp counselors and coaches. You are a difference maker! Please participate in this life-changing experience through sponsoring a child to attend, volunteer, and prayer. Sponsor a Child: $375 or $33 a month!